Who Killed Henry Ford's Hemp Car? 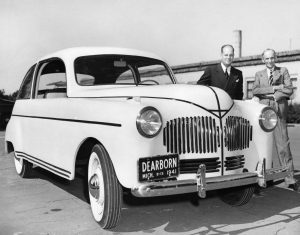 Who Killed Henry Ford’s Hemp Car? Henry Ford built a potentially carbon-negative car out of hemp plastic that ran on hemp fuel almost a century ago. Why aren’t we driving it today? “The ultimate goal Jay is to introduce the world’s first carbon-negative vehicle, and the key to that is going back to what Henry Ford advocated back in 1941, and that’s the idea to make everything you possibly can, including your fuels, out of plant material,” investor Bruce Dietzen says. The carbon footprint of manufacturing a standard car is 10 tons. Because hemp sequesters carbon, the cars would be at least carbon-neutral, he reasons. The car ran on ethanol made from hemp or pretty much any agricultural waste. 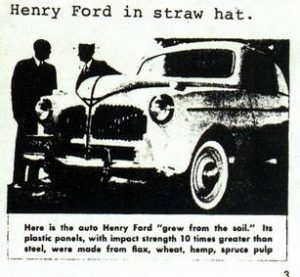 But because growing hemp in the United States was essentially outlawed in 1937 because of its association with its THC-containing cousin, it was impractical for Ford to mass-produce vehicles that relied upon a steady supply of it. If we’re lucky, the Hemp Farming Act will pass with this year’s farm bill, so Ford and Dietzen’s prototypes can revolutionize the auto industry. 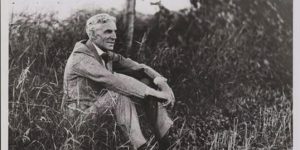 Henry Ford sitting in his own hemp fields. We need to support permanent legalization of hemp. I take hemp based CBD oil daily. It healed my hip of daily intense pain and inflammation due to a long bout of bursitis. It would be wonderful to know hemp would be available to future generations as well! I love the idea of getting off of fossil fuels and moving to hemp for plastics and fuel. Our eorld would be cleaner and healthier! CBD doesn’t come from hemp. Yes it does. Research a topic prior to injecting opinion. Yes it does Robert. It can also come from marijuana, but it would contain much higher amounts of THC which would get you high. Hemp does not get you high. You can learn all about hemp derived CBD at the website link in this post. The reason hemp is proscrbed in many countries is because of its relation to marijuana – basically the same plant, so marijuana cultivation can be disguised in hemp fields. Actually no serious lover of Cannabis would grow their plants anywhere near a Hemp field as the cross pollination would kill the THC level. That, to my understanding, is just an old law enforcement myth propagated to deny Hemp as a competitor to several different textiles which/who sought a monopoly and restricted competition. Umm… yes, Mr. Robert. Yes it does. @ Robert , Yes in fact Hemp does contain CBD as long as its sourced from a food grade quality Hemp farm. Indstrial Hemp has cbd but not as much. Marijuana has even less although high levels of THC. One of the main components of hemp oil is a cannabinoid called cannabidiol or (CBD). This critical phytocannabinoid is actually found in hemp and known for supporting body and mind in many ways. One of the best that is created by the Doctors from WebMD is a product called Qfuse you can get it at http://www.happyhealth.myqsciences.com or I would also reccomend Kannapurecbd.com but its a bit pricier. Both companies are backed with science and medical professionals and are safe. The world is not flat, like you want it to be! CBD does NOT come from hemp. hemp was outlawed due to dupont lobbying. They were beginning to make synthetic fabrics and wanted the hemp textile mills out of the way. J. Johns you are 100% right! That would be my comment but you beat me to it! Tickets car which had most of the Safety Equipment in our cars today. One major thing is the headlights that track with the front tires so you can navigate curves and turns safer. I think it was one of the big German automakers that used them as a selling point recently . SMH over how we just keep letting them screw us. Your close friend. The name was Tuckers not Tickets. Was a great movie about this staring Jeff Bridges. All other facts are spot on. Fords 1941 prototype expressed his vision that not only cars would be made mostly from crops like Hemp, but most everything else humans manufacture. Which was incredibly prescient because making everything from crops like hemp WILL BE THE #1 WAY TO FIGHT CLIMATE CHANGE. How is that you ask? Plants absorb CO2 out of the atmosphere and fast growing plants like hemp absorb it really, really fast! That CO2 is the source of the Carbon that plants use for their structure. Dried plants are 45% carbon in fact! And every atom of carbon (atomic weight of 12) in plant is derived from an atmospheric molecule of CO2 (with an atomic weight of 44). Bottom line: Every pound of dried plant material use to make things removes 1.65 pounds of CO2 out of the atmosphere (.45 x 44 / 12). For more details read the article “How Plants Like Hemp Will Save The Planet” found at http://www.renewsportscars.com. It’s an important article because it sheds light on how we can reduce CO2 in the atmosphere by more than 10 billion tonnes per year…and it is inevitable. We have no choice. We have to do it if we want our great grand children to live. A couple of notes about the article: Ford’s prototype was not a model T. The bodies on Model T’s were made of Vanadium steel. 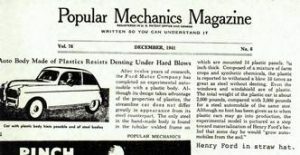 His 1941 “Hemp Car, according to my calculations had a lifetime carbon footprint of less than 5 metric tonnes of CO2 which is about 67 tonnes less than most cars today. 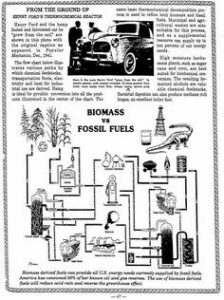 If he had made his hemp fuel via pyrolysis instead of fermentation and plowed the biochar byproduct back into his fields his car would have had a lifetime carbon footprint of NEGATIVE 120 metric tonnes of CO2! This would have been a simple tweak even back then but the climate wasn’t a big issue yet. BTW, every gasoline powered car could have had a lifetime footprint of Negative 100 tonnes or more for the past 80 years but the Petroleum executives are literally so amoral that they don’t care if their own great grandchildren perish. Wrong…This is backed by Republicans ! This is not backed by a Democrat. This is backed by Republicans !!!! hi you say the gop is backing this if so when did they start looking out for the average guy? Thank goodness we have intellectuals like Judith. Occupy THAT! What os the answer to the question posited in the title if the article? Time to resurrect Ford’s dream and vision. Thank you for the great article. Phytocannabinoids is the future of Medicine. medical textbooks will have to be rewritten because of the discovery of the human endocannabinoid system in 1993. And as soon as the doctors decide to catch up.